The most crucial game of the last round was the first loss of undefeated ELOHIM (3-1) in Chimaltenango on Thursday night. Hosts were edged by third ranked Villa Nueva (2-2) 90-89. It ended at the same time the three-game winning streak of ELOHIM. Villa Nueva dominated down low during the game scoring 64 of its points in the paint compared to ELOHIM's 36. They outrebounded ELOHIM 54-26 including a 23-6 advantage in offensive rebounds. Villa Nueva looked well-organized offensively handing out 25 assists. Forward Enrique Samayoa (193-82) saved the victory with a double-double by scoring 28 points, 11 rebounds and 7 assists. Naturalized American power forward Freddy Fernandez (197-92) contributed with 33 points (!!!) and 7 rebounds for the winners. 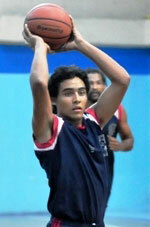 Guard Jose-Joaquin Ortiz (180-78) replied with 25 points and 7 rebounds for ELOHIM. Despite that victory Villa Nueva went down to fourth position due to points difference. ELOHIM at the other side dropped to the second place with one game lost. Villa Nueva will have a break next round, and it should allow them to practice more before next game. ELOHIM will play again on the road against Villa Nueva and it may be a tough game between close rivals. Pampichi's fans can finally celebrate the first win of their team after two consecutive losses. They used home court advantage to defeat La Villa (0-3) 57-54. Worth to mention a great performance of Oscar Lainez (-91) who helped to win the game recording a double-double by scoring 14 points and 16 rebounds (on 7-of-9 shooting from the field) and Diego Villagran who added 14 points and 6 rebounds during the contest. 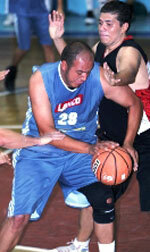 Mynor Maldonado (-95) responded with 14 points and 5 rebounds. It was the only win of host team this round and in all other games visitors recorded victories. Pampichi (1-2) left bottom position moving up to sixth place, which they share with Amatitlan. It was La Villa's third loss in a row. They still close the standings with three games lost. Both teams do not play next round, which will be an opportunity for some rest. Pampichi's fans can finally celebrate the first win of their team after two consecutive losses. They used home court advantage to defeat La Villa (0-3) 57-54. The hosts were tied after three quarters but managed to speed up in last quarter eventually winning the game. Worth to mention a great performance of Oscar Lainez (-91) who helped to win the game recording a double-double by scoring 14 points and 16 rebounds (on 7-of-9 shooting from the field) and swingman Diego Villagran (-93) who added 14 points and 6 rebounds during the contest. Mynor Maldonado (-95) responded with 14 points and 5 rebounds and the former international forward Carlos Chavez (191-89) scored 9 points and 8 rebounds. It was the only win of host team this round and in all other games visitors recorded victories. Pampichi (1-2) left bottom position moving up to sixth place, which they share with Amatitlan. It was La Villa's third loss in a row. They still close the standings with three games lost. Both teams do not play next round, which will be an opportunity for some rest. The most crucial game of the last round was the first loss of undefeated ELOHIM (3-1) in Chimaltenango on Thursday night. Hosts were edged by third ranked Villa Nueva (2-2) 90-89. It ended at the same time the three-game winning streak of ELOHIM. Villa Nueva dominated down low during the game scoring 64 of its points in the paint compared to ELOHIM's 36. They outrebounded ELOHIM 54-26 including a 23-6 advantage in offensive rebounds. Villa Nueva looked well-organized offensively handing out 25 assists. Forward Enrique Samayoa (193-82) saved the victory with a double-double by scoring 28 points, 11 rebounds and 7 assists. 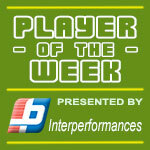 Naturalized American power forward Freddy Fernandez (197-92) contributed with 33 points (!!!) and 7 rebounds for the winners. Guard Jose-Joaquin Ortiz (180-78) replied with 25 points and 7 rebounds and point guard Pablo Cano (178-88) added 22 points and 6 assists in the effort for ELOHIM. Four ELOHIM players scored in double figures. Despite that victory Villa Nueva went down to fourth position due to points difference. ELOHIM at the other side dropped to the second place with one game lost. Villa Nueva will have a break next round, and it should allow them to practice more before next game. ELOHIM will play again on the road against Villa Nueva and it may be a tough game between close rivals.